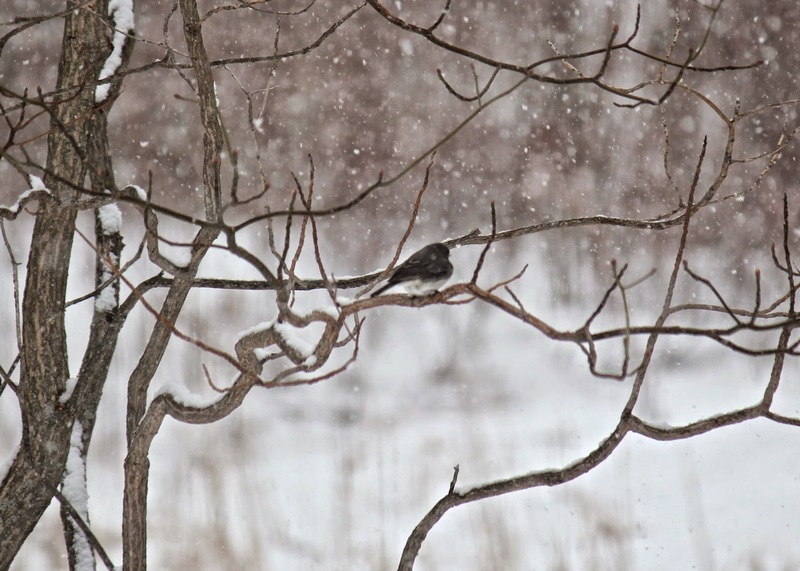 The calendar says we are in Spring now, even though it is snowing outside. It snowed on the first day of Spring as well, ironically. 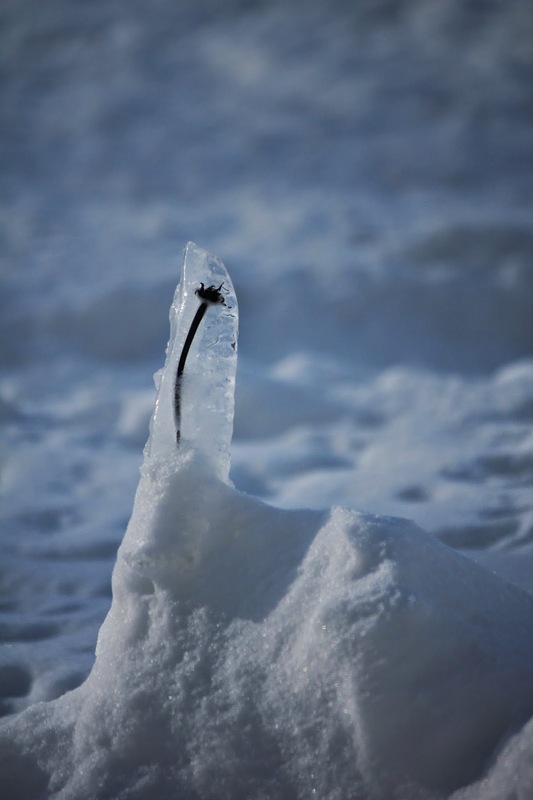 I think Winter has decided not to go without a fight. But thankfully Spring has insisted on a few days of her own. Cold days now alternate with warmer ones, the snow is slowly receding, and, lo and behold, green things are starting to push their way up. Snowdrops transplanted from a friend's garden into mine (and nearly accidentally dug back up several times) hold budding flowers. Being planted next to the house brings them into an extra microclimate of warmth. 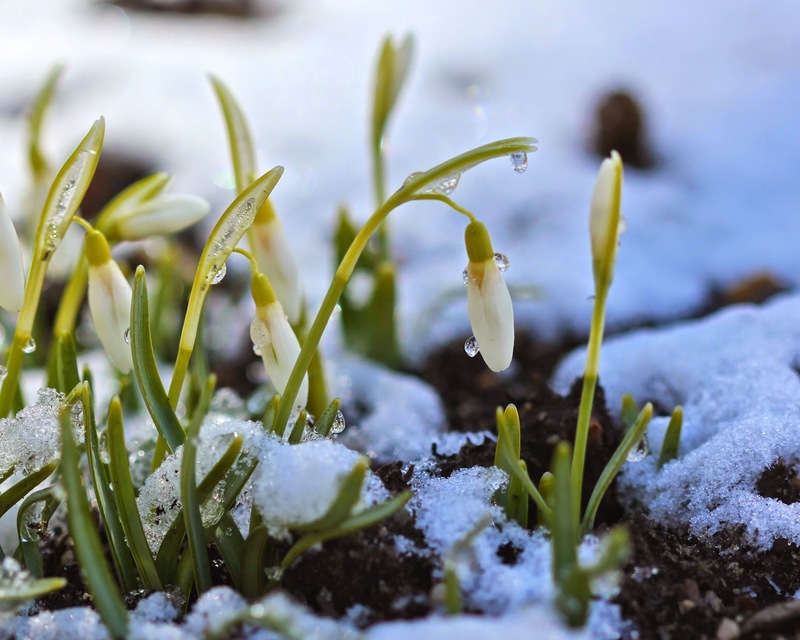 I never thought I should care so much for white flowers after such a white winter, but I can't help but be excited at the thought of blooms in any color after so many months. 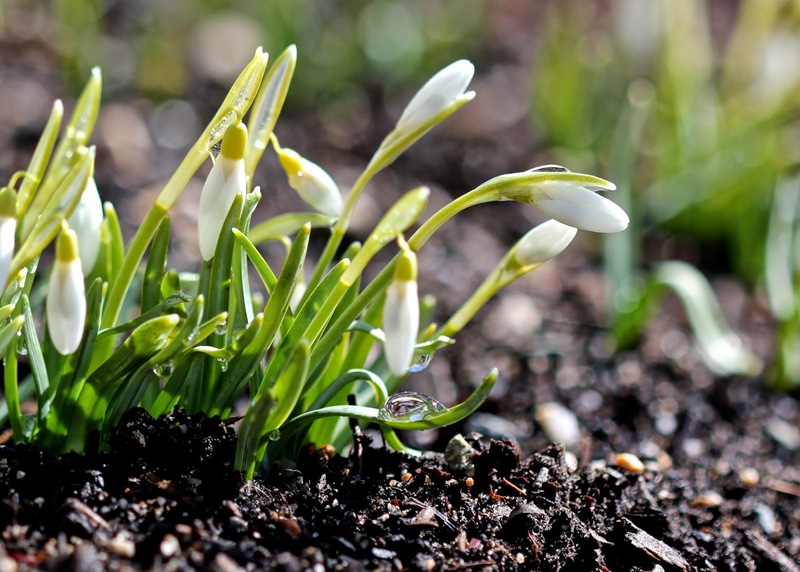 Even with the wintery days, gardeners' faith in a returning Spring is demonstrated in the planting of seeds. Here at the Red House Garden, we've opened the new greenhouse back up, installed grow lights, and plugged the space heater back in. 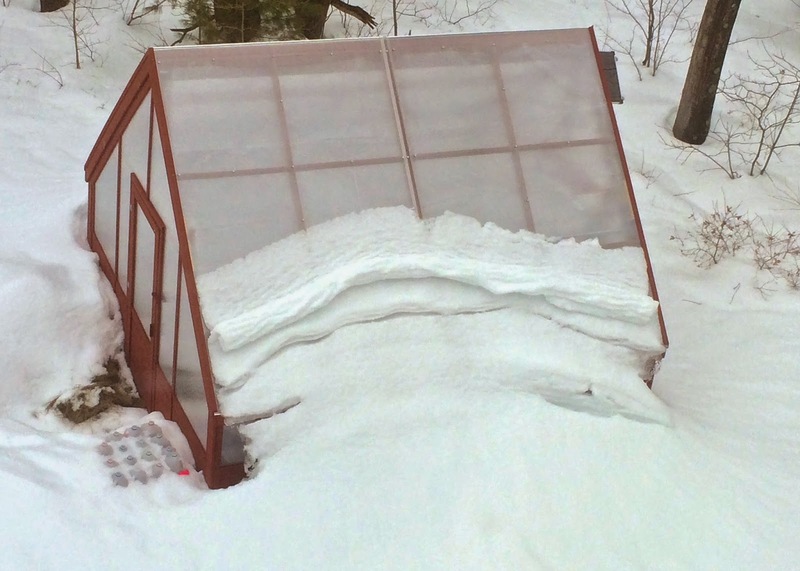 It is now an interesting challenge to keep my seedlings from freezing during the night and cooking during sunny afternoons. During a few of the wintery weeks, I winter sowed about twenty different kinds of perennial seeds. 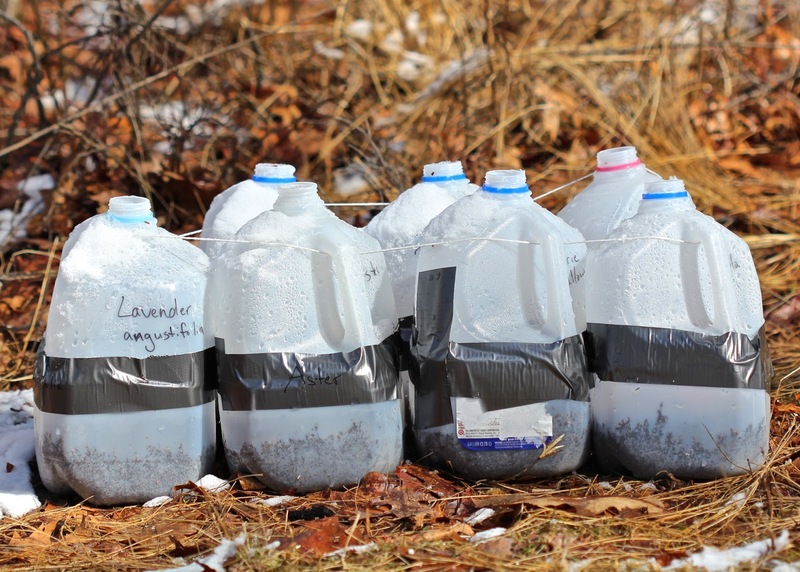 Groups of milk jugs are scattered around my backyard, full of seeds waiting for the right time to germinate. Hopefully it won't be too long, now. 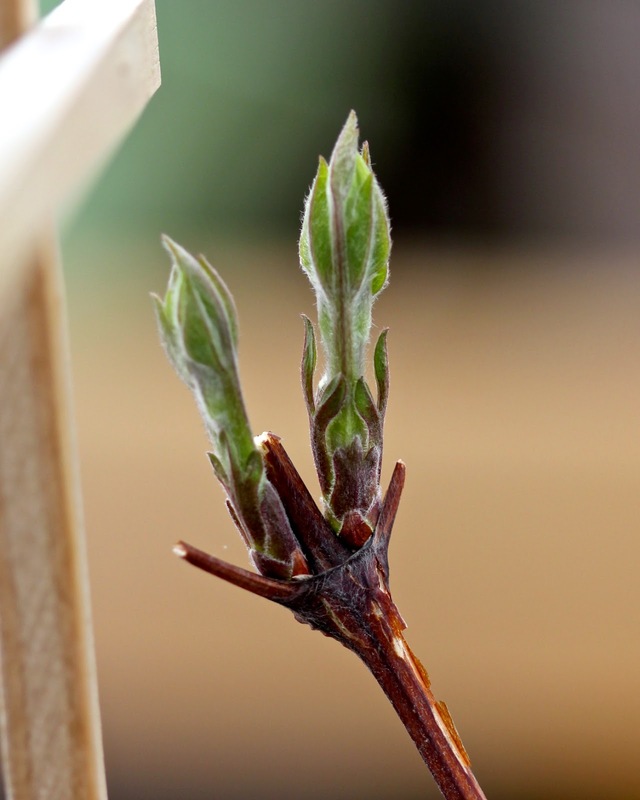 Happy Spring to those of you whose gardens have already come to life. And happy dreams of Spring to those gardeners who, like me, still lie in wait. 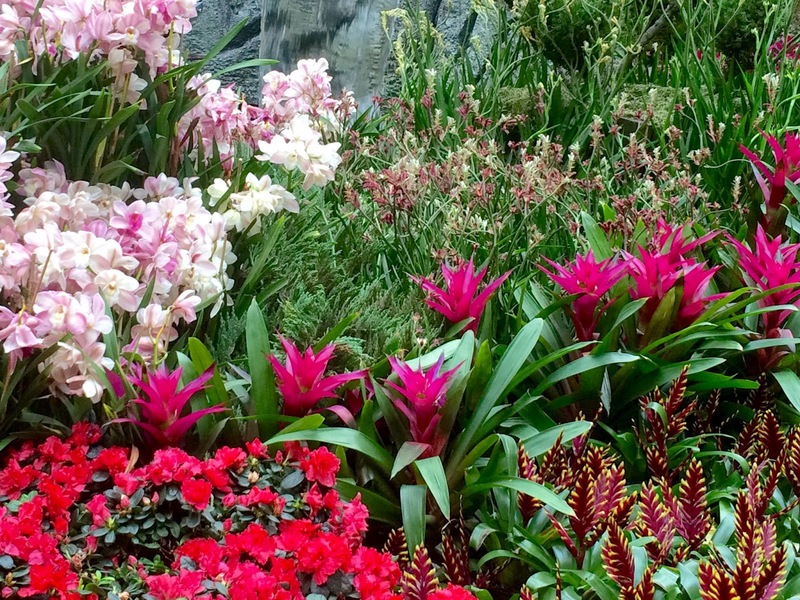 A few days ago, we got a brief break from the snowy winter weather by attending the 2015 Boston Flower Show. 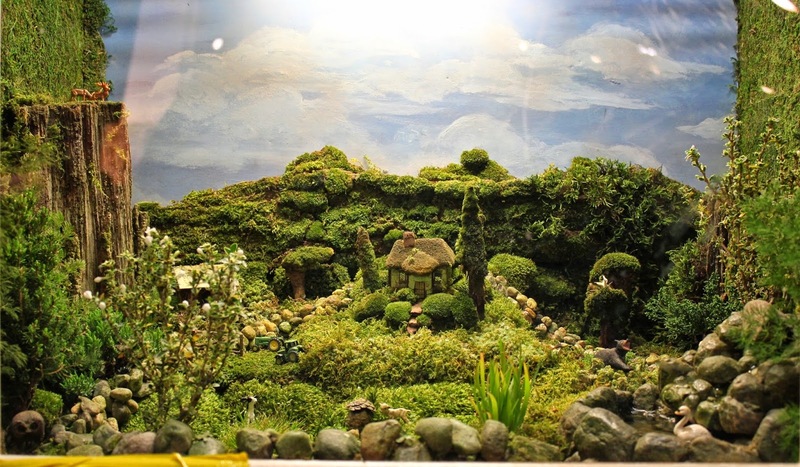 The theme this year was 'Season of Enchantment', and I have to share with you one of the most enchanting parts of the show - the Massachusetts Horticultural Society's miniature gardens competition. 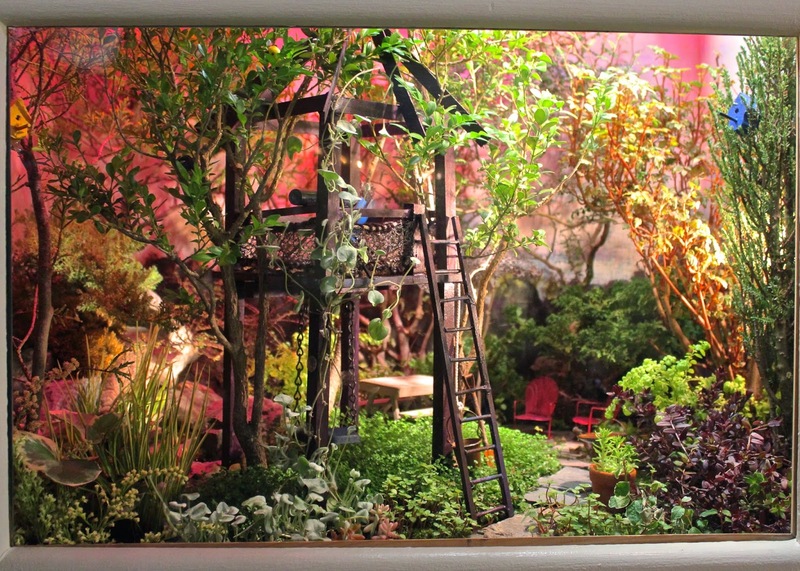 Each miniature garden is in a box and viewed through a glass window that is about 2 feet wide and a foot and a half high. The gardens are judged on how it represents a larger garden, with a scale of 1 inch equalling 1 foot, at least for the part in the foreground. Combining both horticulture and design on an intricate, scaled-down level, the results are impressive and amazing. There were two entries at the Boston Flower Show this year. The first one, by Gloria Freitas Steidinger, is titled 'The Lot Was Pasteurized', and shows a charming scene of a home in the woods. It is complete with miniature lambs frisking through the front yard, a water feature with a swimming swan, miniature moose or elk surveying the scene from atop a cliff, and tractors resting in the nearby field. I love all the little plants and moss that help create the scene. So cute! 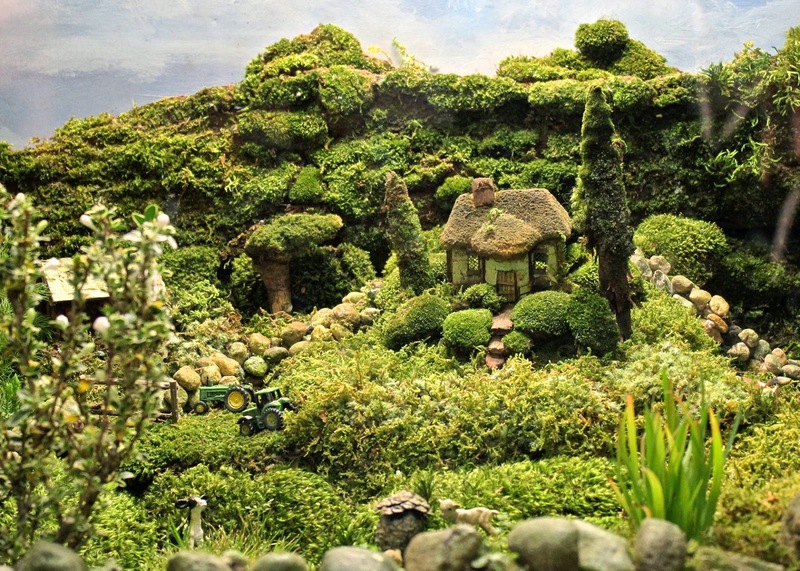 The second miniature garden was created by Debi Hogan and Warren Leach, and shows an enchanting scene of a playhouse up in the trees, complete with vines and children's playthings. Birdhouses hang in nearby trees, and a stone path leads to a picnic table and chairs behind the playhouse, completing the look of a miniature backyard retreat. The variety of plants used was astounding. It truly looked like a lush, miniature backyard garden, full of bushes, trees, vines, grasses, and even flowers. Can you believe this was all done with little tiny plants? I wish I would have taken even more pictures of all the little details going on in the two gardens - it's worth clicking on the pictures above to enlarge them so you can see how many things are going on. 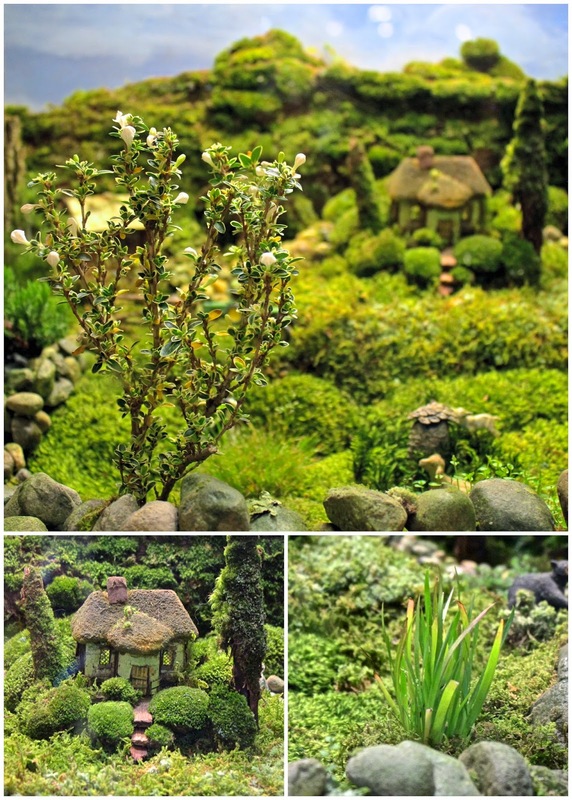 The miniature gardens truly were enchanting, and just seeing them makes me itch to get some tiny plants and make a miniature garden of my own in a terrarium or something! 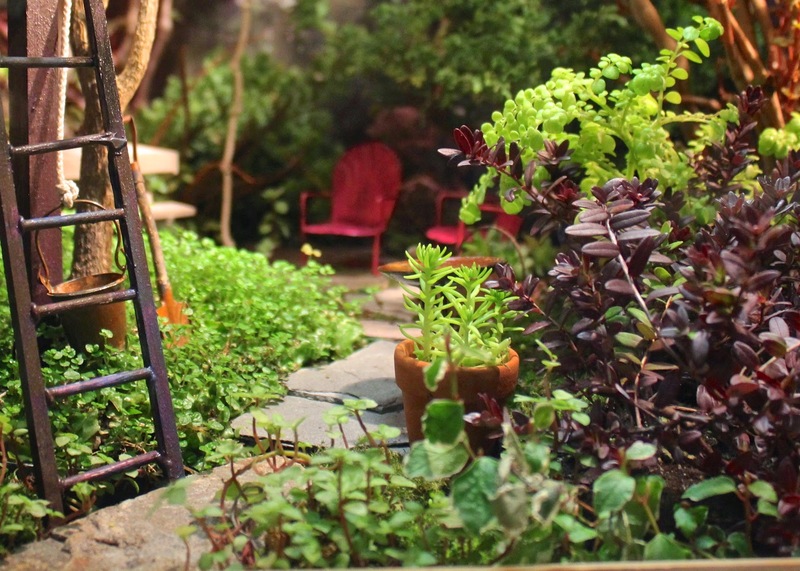 I don't remember seeing the miniature gardens competition when I went to the Boston Flower Show last year, but from now on I know to be on the lookout. So charming! Many of you know that bee-lovers have been pushing companies to label their plants for neonicotinoid pesticides. Neonicotinoids are pesticides that are absorbed into the leaves and stem and other parts of the plant from the roots up. Thus, they are less harmful for humans to use because you don't have to worry about residue or spray drift, but unfortunately they are also suspected to have a detrimental effect on helpful wildlife such as bees. 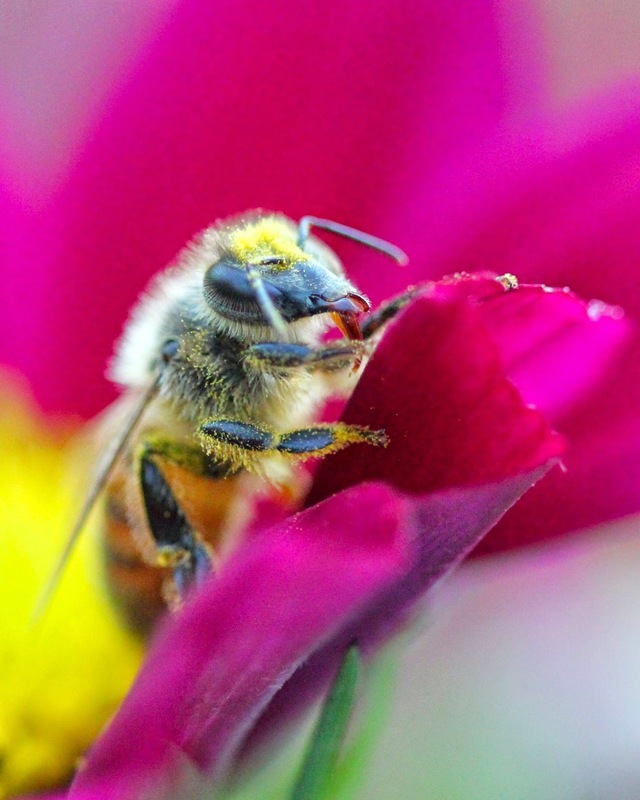 Recent studies have shown that, even though the low levels of neonicotinoids in plant nectar and pollen don't outright kill bees, it still adversely affects the bees' brains, causing them to struggle to learn and remember things. 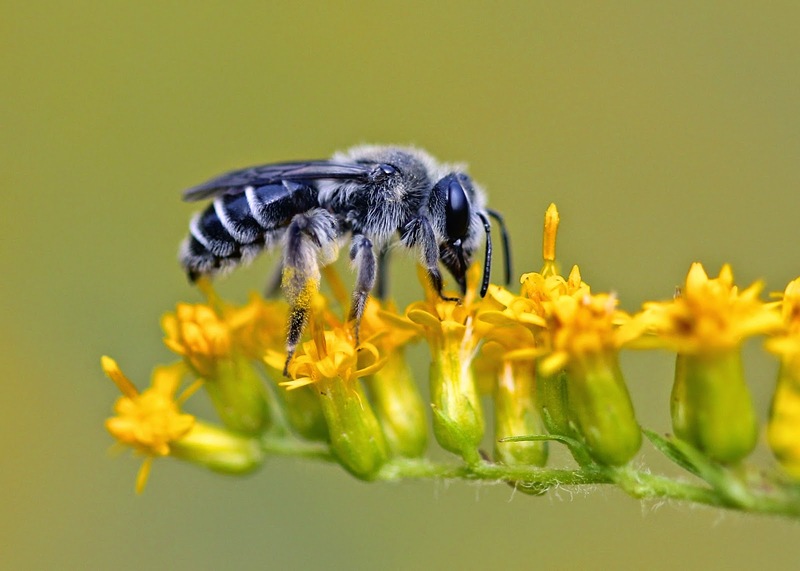 Studies have found there is a relationship between neonicotinoid use and the Colony Collapse Disorder of bees, which has gotten so much press lately. neonicotinoids, two of which are Imidacloprid and Clothianidin. 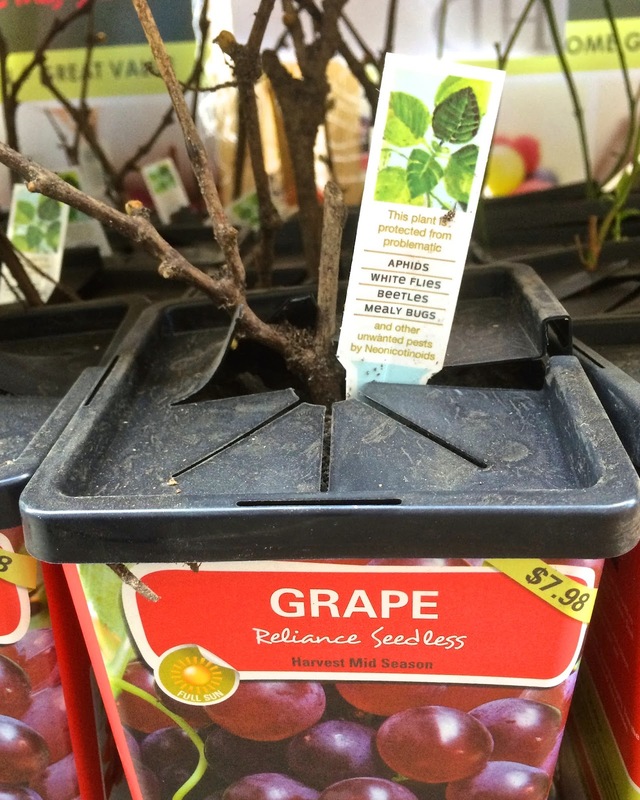 Since many gardeners certainly don't want the plants in the garden to be contributing to the death of bees, people have been petitioning the big box nurseries to label their plants for these pesticides. I have to applaud BJ's Wholesale Club and Home Depot for stepping up (yay!). They both have agreed to require their vendors to either stop using neonicotinoid pesticides or to label for them if they do continue to use them. I was at Home Depot the other day and got to see their new labels. They say, "This plant is protected from problematic Aphids, Whiteflies, Beetles, Mealy Bugs and other unwanted pests by Neonicotinoids." 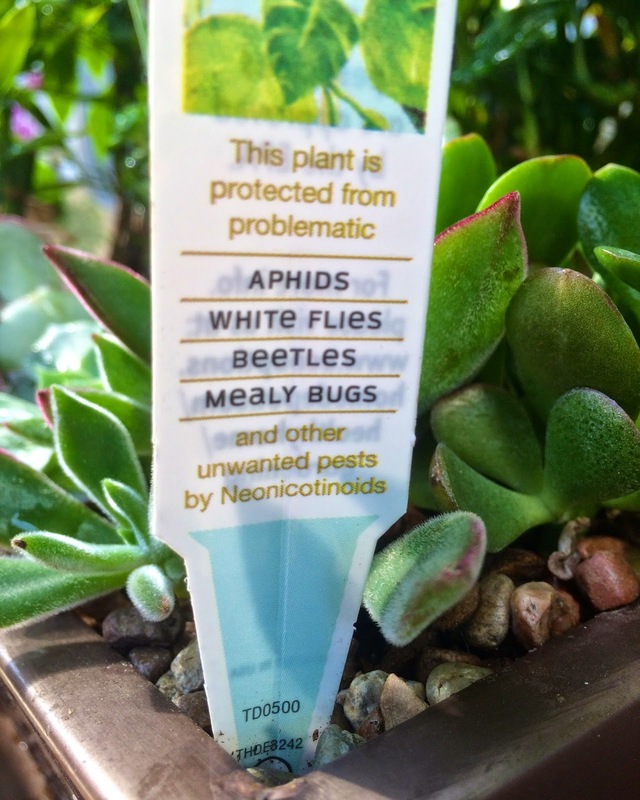 Wow, I am impressed with their marketing team - here I was expecting them to have a little tiny label shamefully admitting a plant had neonicotinoid pesticides, but instead they were spinning it into a positive thing! What about outdoor plants, though? Do many of them have labels? 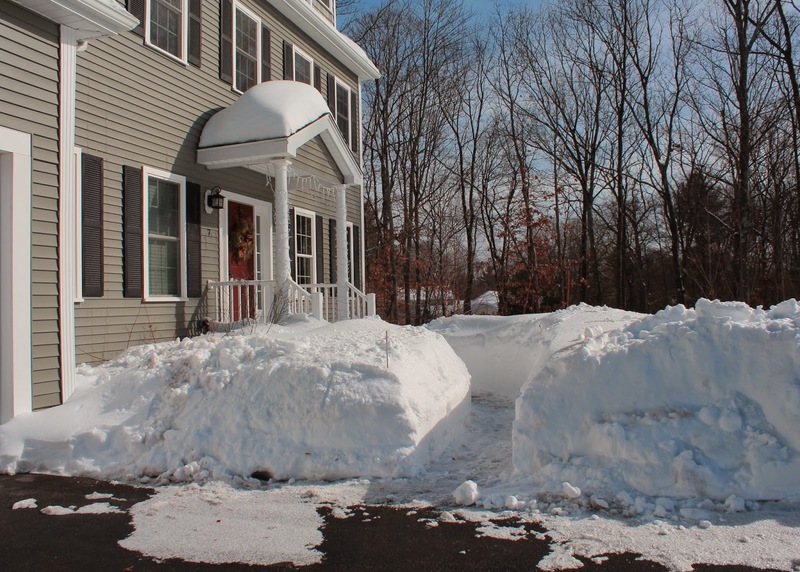 We don't have a lot of outdoor plants in stock yet, as it is definitely still winter up here in the Boston area. 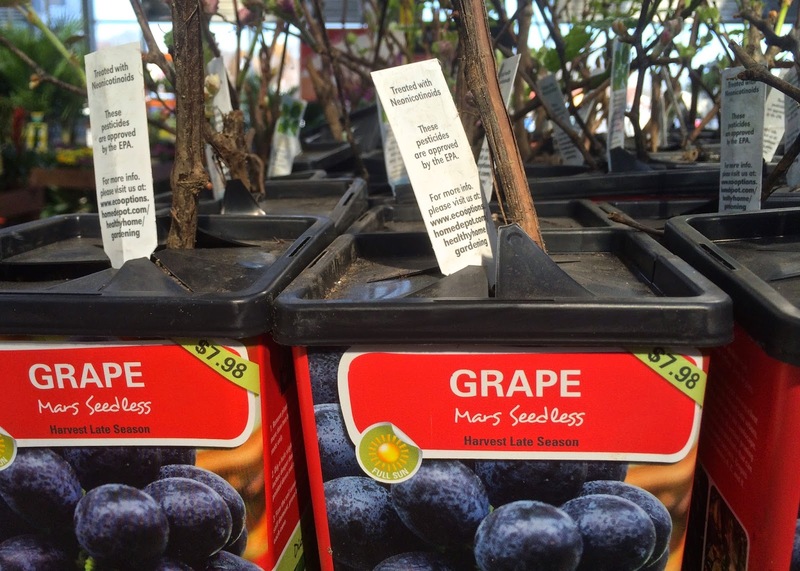 Home Depot only had their berry plants and grapes in. 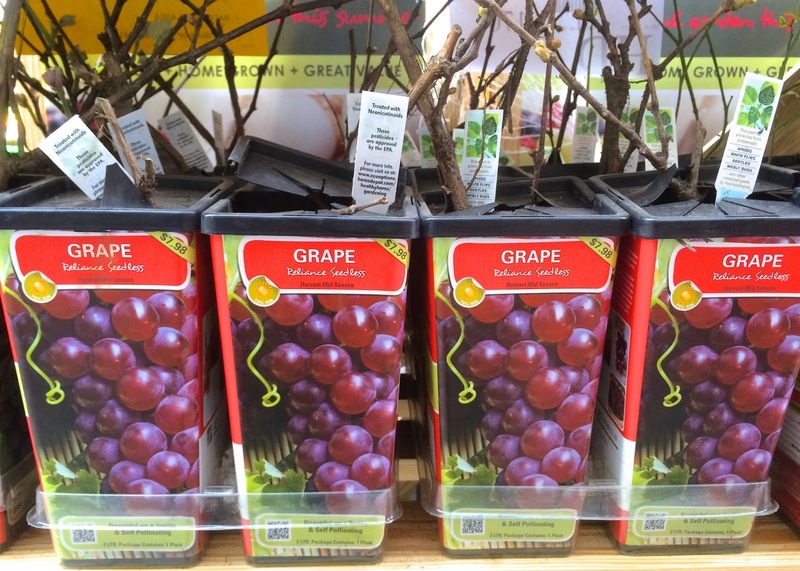 I was glad to see that most of them were not grown with neonicotinoid pesticides, though there were a couple varieties of grapes labeled for it. I guess time will tell as to whether or not people will buy them. 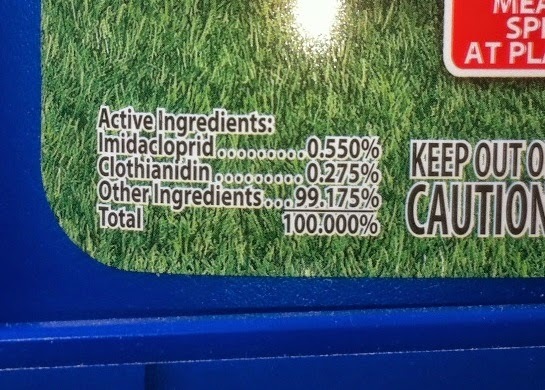 Hopefully, the labels will lead people to be more cautious about buying these plants, or, at the very least, cause them to do a little research about what these pesticides are that are on their plants. And hopefully, people will make different choices in their plant buying - putting pressure on growers to use alternative (and hopefully more wildlife-friendly) pest management. So has anyone else seen these labels? Or seen BJ's tags? 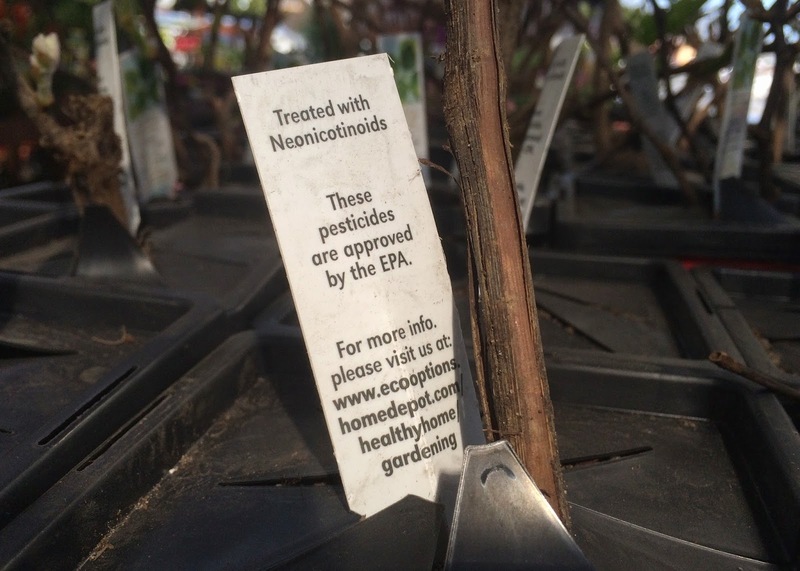 I am hoping some Southern gardeners can tell if many of their outdoor plants are labeled with neonicotinoid pesticides. 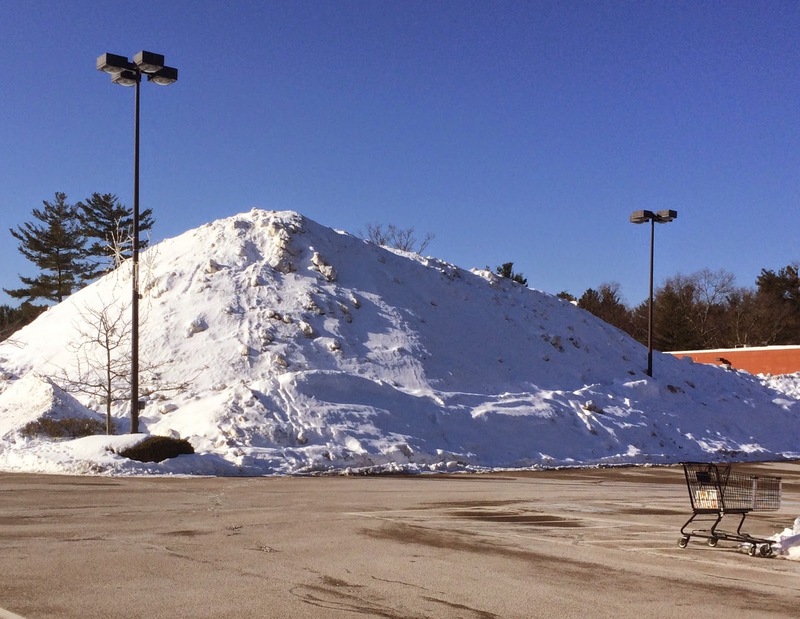 I am hoping, too, that other big-box stores will follow Home Depot and BJ's leadership in giving their consumers the ability to make more knowledgeable choices! Kudos to them! 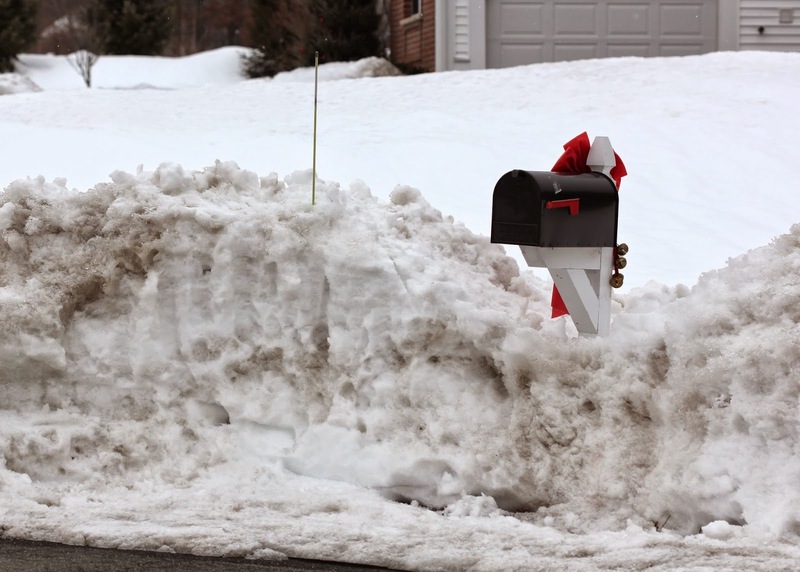 ...and instead I used you to break up icy mounds left by the plows at the end of our driveway and around the mailbox. My dear Garden Hoe, I know that you expected to be scooting around dirt and disturbing weeds when I pulled you out of the garage. you might not have seen the light of day until June. 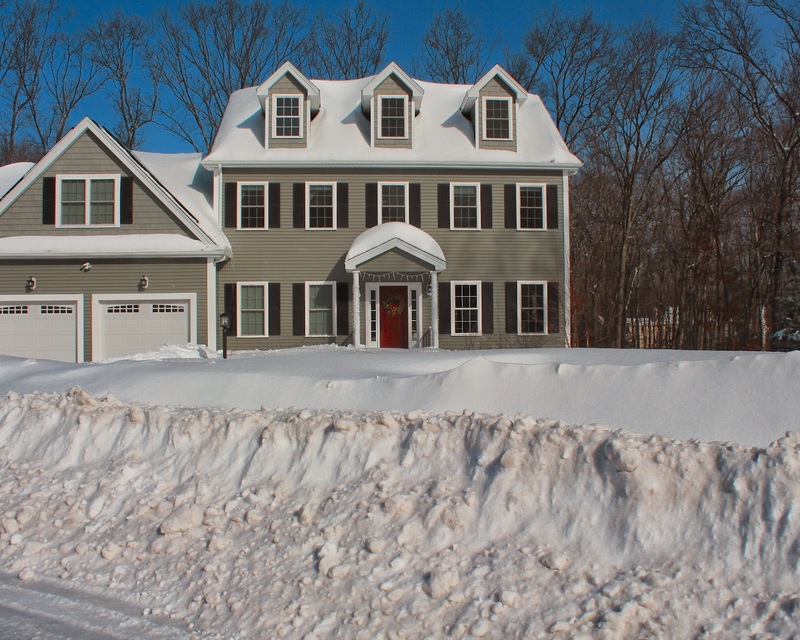 For the last month, the Boston area has been pounded with blizzard after blizzard, shattering records for snow and cold. - after they trucked out a lot. For a few days, I was delighted to join my husband while he was at a conference in nice, sunny Las Vegas! 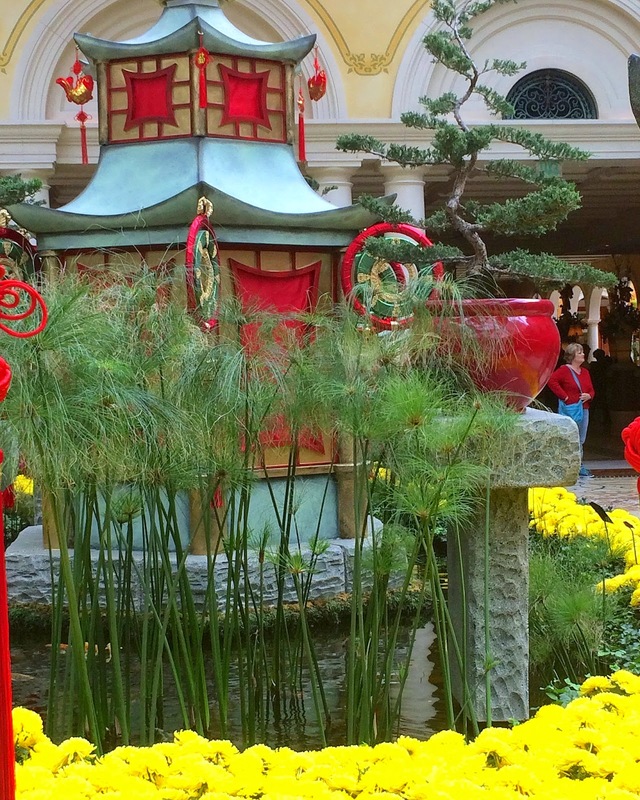 Now where does a gardener go in Las Vegas (especially one who is not very lucky at slot machines)? 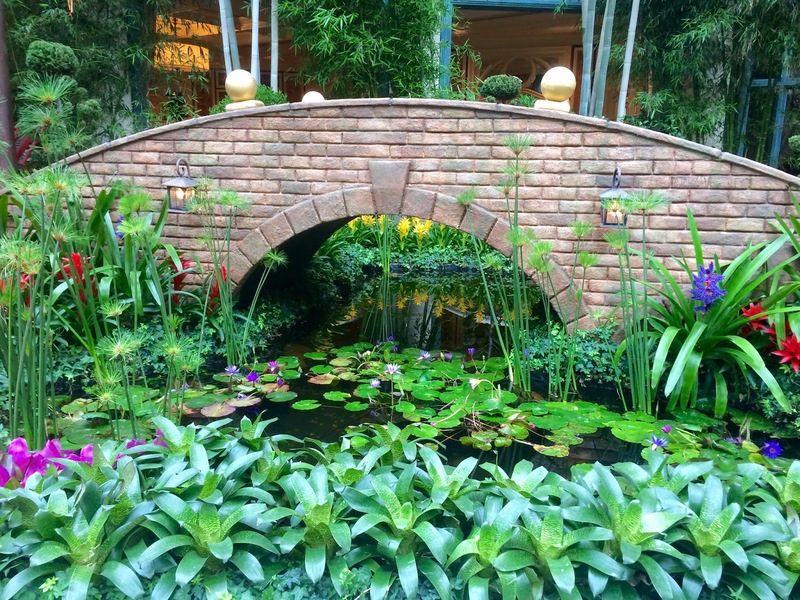 The largest garden on the Strip: the Bellagio Conservatory and Botanical Gardens. 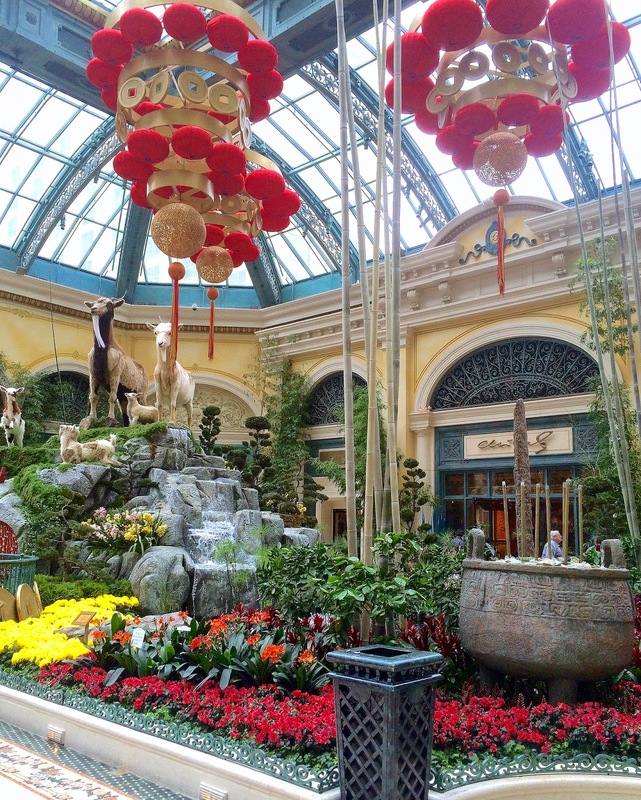 Set under the 55-foot tall glass ceiling of the Bellagio's Conservatory, the gardens change every season according to a theme that is designed, implemented, and cared for by an army of over 100 horticultural staff. As a gardener, I was a little disappointed to find out that it was less a botanical garden and more an extravagant floral art show, but it was still fun and impressive to see. The theme while I was there was 'Chinese New Year', and flowers and plants were used to build beautiful Asian-themed vignettes. 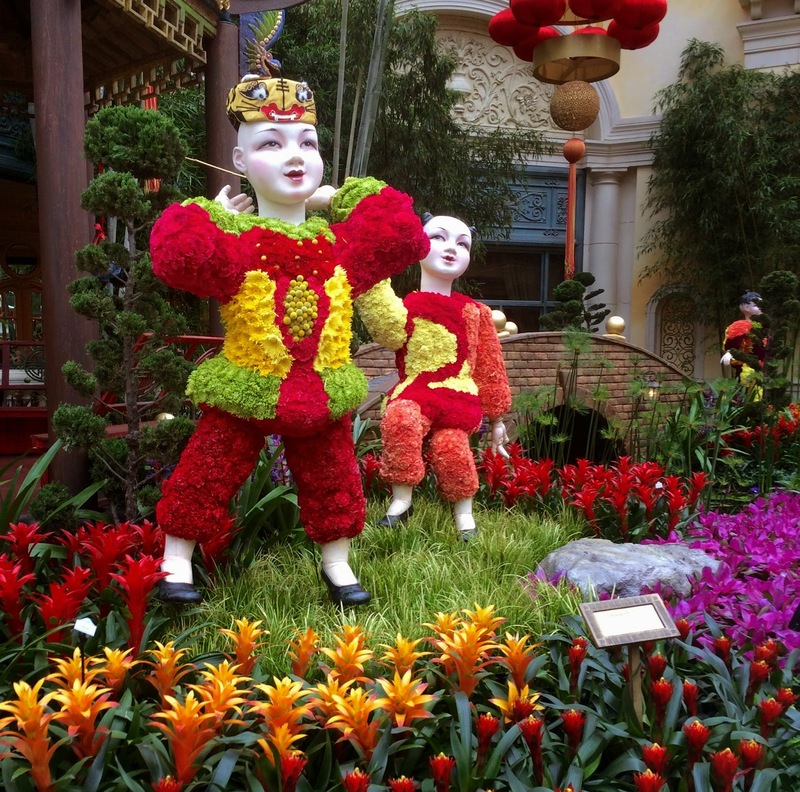 Several Chinese children frolicked through the garden, their clothes entirely made of flowers. Water constantly ran through the displays, and I wonder how often they had to change out the flowers. All of the thousands of flowers and plants looked incredibly fresh and healthy. Each of the plants on the ground level was in its own (well-hidden) pot, ready to be changed out as it faded or wilted. 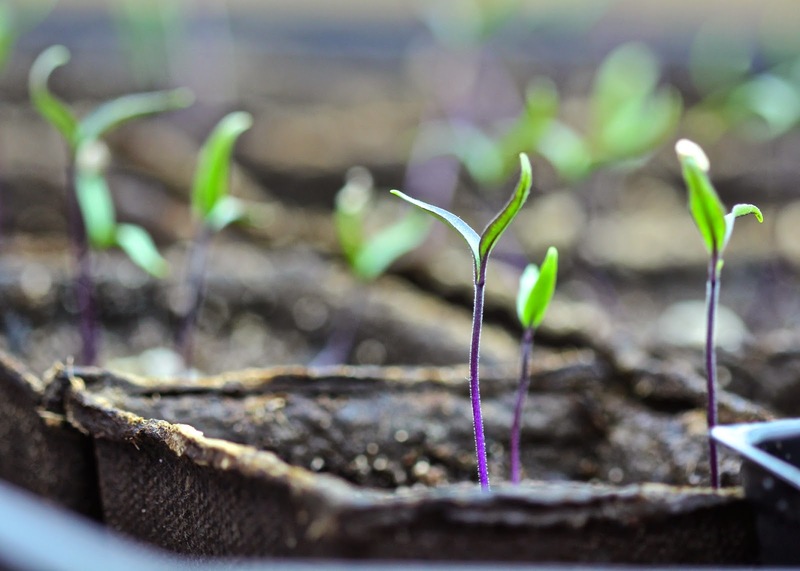 According to their information online, more than 10,000 potted plants are switched out over the course of two weeks in the garden. 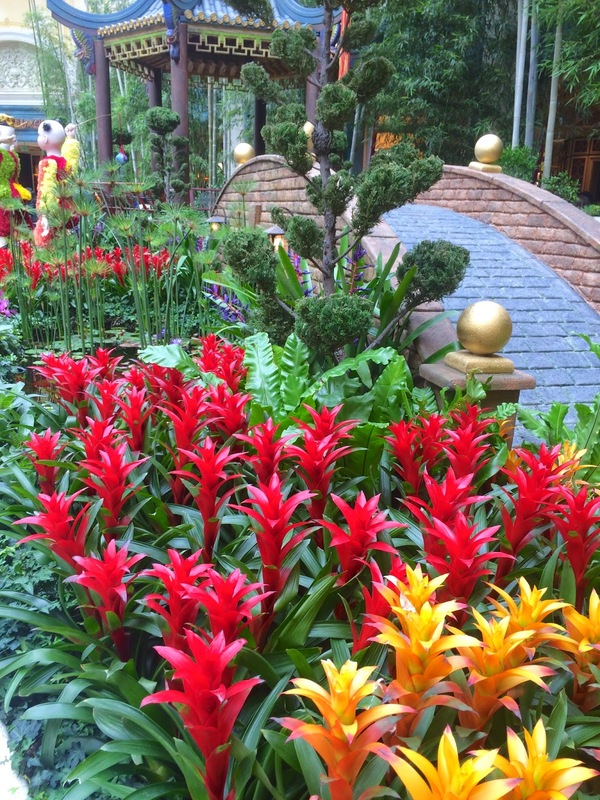 After their short life, the old plants are turned into mulch for the rest of the Bellagio grounds. Bamboo and Juniper topiaries served as vertical accents. 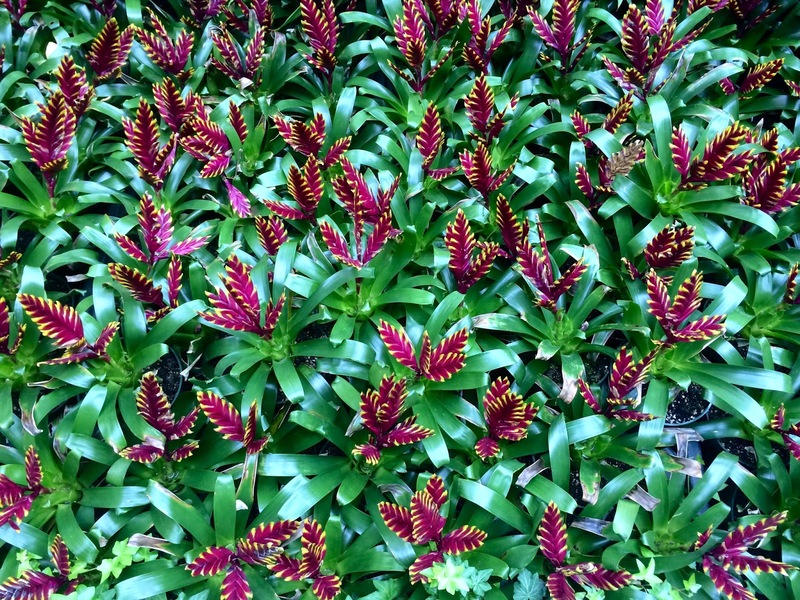 Most of the flowers were different Bromeliads and Chrysanthemums, but there were also orchids and a few other flowers I did not recognize. It was impressive to see such a site in the middle of the dessert. It is also impossible to capture the scope of how large the place was with my little camera phone. Such a nice vacation! I enjoyed the Conservatory, and I just enjoyed walking around Las Vegas without needing five layers of winter clothing and snow boots!